After the spirit form of Dai Shi was released and he took over the body of Jared, he returned to rule from the place of his capture: his palace. In this place of ancient evil, there is an infinite supply of Rinshi armies and powerful warriors to be used as vessels for fear and destruction. A evil known as Dai Shi believed that animals should rule the planet, and humans were to be erased. Over 10,000 years ago, brave warriors channeled their Animal Spirits, and after the Beast War, they were able to imprison Dai Shi. The Pai Zhuq was formed to serve as protectors of him. Presently, Dai Shi accidently escaped and returned to his palace where he began to command his assisstant Camille and his army of the undead. 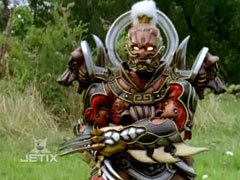 Dai Shi lives off fear and the more humanity grows scared, he becomes stronger. 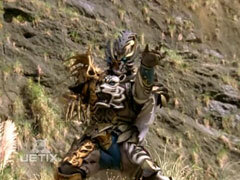 With the help of the Five Fingers of Poison, people's fear increased and he was able to morph into an armored Lion form using Jarrod's Lion spirit. Dai Shi doesn't care if Camille gets destroyed just as long as he made progress in her mission. He sees everyone of his warriors as just a tool he can use to succeed in his mission and they don't mean anything to him. 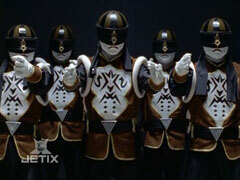 Living as a human, he believe he knew how to defeat the Rangers. He retained Jarrod's memories and they were one, but eventually Dai Shi started to loose control of Jarrod. Casey fought Dai Shi and he was forced out of Jarrod. Dai Shi opened a portal to the Spirit World and revived selected fallen warriors. 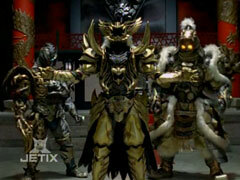 All seven masters of the Rangers united and donned animal forms, which Dai Shi took to become his ultimate Dragon form. He was weakened by Jarrod and finally destroyed by the three guardians. He was a student at Master Mao's temple and wielder of the Lion spirit. 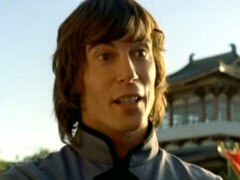 Jarrod was highly skilled and was selected to one of the guardians of Dai Shi's prison. Unfortunately, Jarrod's arrogance forced Master Mao to dismiss Jarrod and select Casey instead. After a brief battle with Master Mao, the chest accidentally opened and brought Dai Shi to the real world once again. Dai Shi defeated Master Mao. Jarrod ran off, Dai Shi saw his fear and took over Jarrod's body as a host. When Dai Shi became Phantom Beast King, Jarrod adopted a stronger Griffin form. Dai Shi told Jarrod that he lacked the heart of lion, he chose him because he hadn't a shred of nobility or kindness. Three Phantom Beast Generals were sent to kill Camille and he managed to destroy two of them. Casey believed in him and helped release him from Dai Shi. 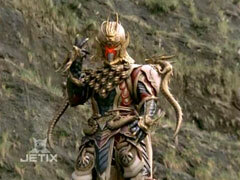 His Griffin armor was stripped from him by Dai Shi. He helped fight against Scorch and Snapper, but when asked to help in the final battle, he was ashamed of his deeds and who he was and believed there was no going back. It was until Camille left to help, that he finally got the courage to stand up to Dai Shi. After the final battle, he was a student in Casey's class in the Phi Zhaq academy who could also assist. When Dai Shi returned to his palace, Camille emerged from a wall, where she waited for his return. She has the ability to blend into anything in order to hide or sneak up on anyone at any time. She is unabashedly loyal to her master and assists at collecting fear and will do anything to help defeat the Power Rangers. With the spirit of the Chameleon, she can change into a warrior form. Like Dai Shi, she commands the Rinshi and can give them more power when she wants. She uses her lengthy tongue to whip or constrict people in her way. Even though Dai Shi trusts her very much, he never thanks her and considers her expendable. Naga, one of the Five Fingers of Poison unsuccessfully attempted to lure her away from Dai Shi and offered her real life, but she destroyed him and took three of his Life Talons Dai Shi needs to resurrect the Overlords. 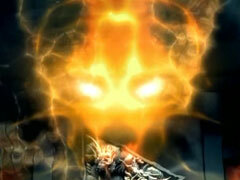 When the Phantom Beasts arrived, Camille wanted Rinzin power and was granted such by Dai Shi and donned a Phoenix form. When Dai Shi started loosing control of Jarrod, he saved her from two Phantom Beast Generals sent to kill her. Her feelings went to Jarrod, who clearly cares for her and assisted in destroy Snapper with the Rangers. When she stood up against Dai Shi for Jarrod, she was stripped of her Phoenix form. When the Rangers needed help in the final battle without Jarrod, Camille went to help because of Lilly's belief in her. Later, she joined the Phi Zhaq academy as Casey's student to redeem herself and start anew. 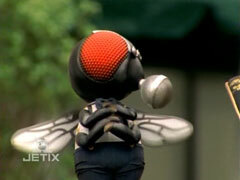 Flit is an anthropomorphic fly warrior that was once human. Long ago, Camille defeated by cursing him as a fly and swallowed. 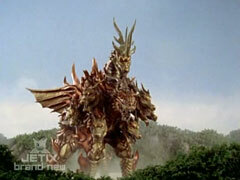 He lives inside of Camille and occasionally escapes to provide commentary during Zord battles. He commonly cheers the Rangers on in battle, and makes snide remarks towards Camille. To Camille, Flit is extremely annoying and when she hears enough from him she swallows him back in. When Flit was thrown back in a battle and was saved by debris by RJ. He considered them friends and wanted to repay him. 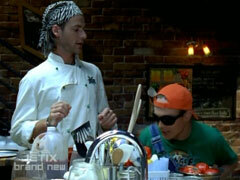 He has a secret ability using his voice, he used this to enable RJ to fight his werewolf side and ultimately tame it. Part of Camille's curse is that Flit can't live too long outside of her stomach. Just when RJ accepted Flit as his friend, Camille took him back. After the war was over, Flit was turned back into a human by Camille and became a Karma Pizza employee. The Rinshi are the Dai Shi's army of fear that he revived. They wield lances and do all his dirty work for him. The Rinshi live off of people's fear, the more afraid you are the stronger they grown and become. They wear blind folds over their eyes, but when certain Rinshi are promoted to a higher rank with a animal symbol on their forehead, they take on a new form, a Rinshi Beast. Camille fetched three bracelets from a compartment that held the essence of the three Overlords. With the Life Talon from the fallen Naja, Dai Shi resurrect the Sky Overlord Carnisoar to his aim to be stronger. Carnisoar took Jarrod into the past to eliminate every good deed that he did, making him much more evil. Carnisoar is a Hawk spirit master. Camille is not fond of Carnisoar's brutal teaching methods and Carinsoar doesn't think much of Camille. After Jellica is revived and Jarrod manages to best Jellica according to her plans, Carnisoar leaves the rest to her as he flies off. 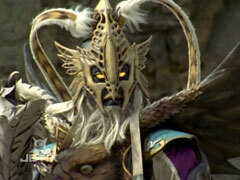 He returns to power the two Shadow Guards to prove Dai Shi as an agent of evil. 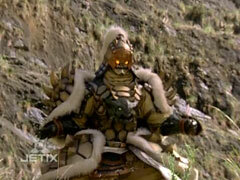 He fought the Rangers near the Rhino Nexus and was destroyed by the Rhino Steel Megazord. Camille got the idea of reviving the Sea Overlord from Lily when she visited the Jungle Karma Pizza resturant in disguise after being kicked out by Carinsoar. 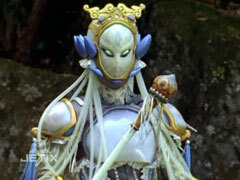 Camille planned Jellica, a Jellyfish spirit master, to be Dai Shi's master, but instead she wanted to trained Camille. When an enemy tries to attack Jellica, she can have them pass right through her. After she personally defeated the Jungle Pride Megazord, she orders Camille to take down Lily, but when Camille refused to, Jarrod takes on Jellica in a brief scuffle. Jellica then reveals this was her plan all along, by mentoring Camile was to see if Dai Shi really did desire her power. Jellica becomes Jarrod's new master, guiding him in the ways of deceit and hatred. With Grizzaka in charge, she sided with him and when it came to who held the Crystal Eyes, Jellica took them from Dai Shi and resurrected them to go against Dai Shi, but she was destroyed by the Phantom Beast Generals. 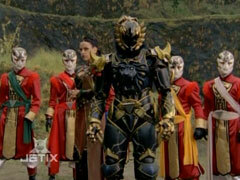 The two Overloads thought they needed to call for more power and Dai Shi was immediately against it. Carinsoar gave Camille the last life talon to revive him from the Cave of Darkness and she merely tossed it in to revive him. He is the holder of the Bear Spirit and the Zocato power, which he can make his followers grow. Grizzaka blames Dai Shi for loosing the Great Beast War and detests human because they are weak and because Dai Shi is now human, it makes matters worse. He took over Dai Shi's palace as leader of the evil movement against the Pai Zhuq practitioners. He marched with a horde of Rinshi into Ocean Bluff and after a rampage with the Rangers, he was destroyed by the Rangers' five Animal Spirits combined. 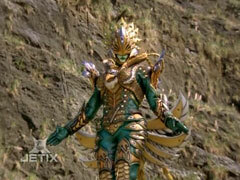 The leader of the Phantom Beast General, he holds the spirit of the Avalon Dragon. 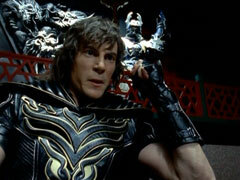 He is loyal to Dai Shi, but not to Jarrod and offered to make him the Phantom Beast King. The Phantom Beasts were released from the Crystal Eyes and had to at a specific outlet of time. He and Snapper conspired against Camille, because they believed she brought the human side out of him. He sent three warriors against her, which Jarrod save her from. As a battle escalated, he became giant and was defeated by the Ranger's Beasts along with Camille and Jarrod's. He returned to Dai Shi where he was sent to incite fear and was defeated by the three newly appointed masters. He returned when Dai Shi revived his fallen warriors and he was finally destroyed. A Phantom Beast General that holds the spirit of the Snapping Turtle and is Scorch's faithful partner. He helped in capturing three Masters and making them into Spirit Rangers. He considered Camille not worthy of being a General. Camille confronted him while he was eating to why he and Scorch sent warriors to assassinate her. 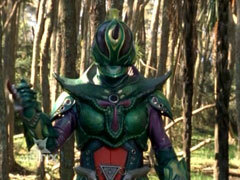 He revealed that she was closer to the human, she denied this, but later fought and help destroy him along with the Rangers. A Phantom Beast General that holds the spirit of the White Tiger and Dai Shi convinced him to steal Casey's Tiger Spirit. He was defeated by Casey and disgraced because he was unable to defeat him. In a controversial move, Dai Shi stripped him of his Rinzin. And without it, he was slowly fading. He assisted Casey in rescuing the Rangers and fought against Camille. He faded away, but not from Casey's memory.